A FANTASTIC COMBINATION OF PERSONAL FAN & POWER BANK in one unit by Skyocean up-to-date technology. Make the Life More Simple. Need more fresh air when Fishing, Running, Biking, Camping or sports? Need some cool air with low noise on a hot mid-night? Need a air blower when BBQ? Need a extra Emergency power source when your battery is drained outside? Need to replace the dry battery or recharge your fan frequently every day? If Yes, Skyocean power bank fan can solve all these problems in one shot. 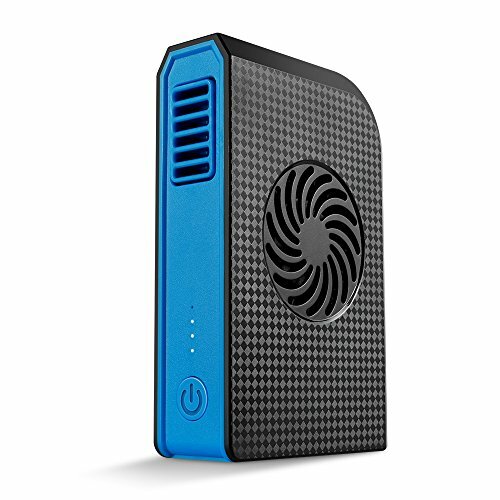 We have thoroughly studied nearly all the personal fan and power bank you can buy on US market, carefully looked through all users' reviews and complaints and developed our own Skyocean BOX FAN with PORTABLE CHARER. ✔Compact and easy to carry. ✔Charge your electronic device when using the fan or at any Emergency. ✔You can adjust the angle of the wind outlet. ✔Super long operation time of 6-12 hours depending on speeds after fully charged. ✔Amazing Gift: Bring this fan to your family and friends means bring them lots of fresh air, funs and battery power. 1) This fan's case is made by plastic material, so sometimes it smells not good at the beginning, but this smell will be gone after several days use. 2) This fan is designed as a mini personal fan with small size, so it can't blow as strong air as some desk fan with large size. 3) This fan is powered by a motor with rotating speed of 4200RPM, so it may feel a little noisy in a completely silent environment. 4) Please contact us if the fan you received is not working, we will issue the full refund or send replacement immediately. ✔ MINI FAN & POWER BANK 2 IN 1, This Battery Powered Fan is a necessary travel accessories and camping gear, Small size, but powerful enough to push a lot of air efficiently. Plus it doubles as a cell phone portable charger which is a huge plus especially when travel! Also Best using for Camping, office, kitchen, Baby Stroller or outdoor sports such as Fishing, Hiking, Backpacking, BBQ, Picnic, Biking, Boating, Golf. ✔ PORTABLE RECHARGEABLE HANDHELD FAN-- This Battery operated fan with Small Size, powerful desktop fan , You can hold it in your hand, fit in pocket, camping backpack or purse and take it anywhere you are going. this box fan has 3 speeds modes (high, medium and low) offers you a strong and sufficient fresh air and the angle of the wind outlet is adjustable. ✔ BUY 4 SAVE 10% & 1 YEAR WARRANTY - We love our customers and want them to love us too. If you buy 2 of our battery fans you can immediately save 5%. Buy for a friend or loved one and save together! For all Skyocean products we promised 30 days money back, 1 year replacement warranty and prompt friendly customer service in 24 hours. If you have any questions about this product by Skyocean, contact us by completing and submitting the form below. If you are looking for a specif part number, please include it with your message.